James Cohan Gallery is pleased to present its fifth gallery exhibition by internationally acclaimed American artist Bill Viola. The exhibition opens October 23rd and runs through December 19th, 2009. For over 35 years Bill Viola has been instrumental in the establishment of video as a vital form of contemporary art, greatly expanding its scale, creative scope and historical reach. He has created video films, architectural video installations, flat screen pieces, sound environments, electronic music performances, as well as works for television broadcast, opera, and sacred spaces. His works focus on universal human experiences—birth, death, the unfolding of consciousness—and have roots in both Eastern and Western art as well as spiritual traditions. They employ state-of-the-art technology and are distinguished by their emotional power, precision and direct simplicity. The exhibition spans two decades and includes the New York premiere of Pneuma (1994/2009) a video/sound installation, and several flat-screen pieces from the Transfigurations series, Viola's newest body of work, which originated with Ocean Without a Shore, created for the 15th century Church of San Gallo during the Venice Biennale in 2007. Pneuma, one of Viola's signature full-room installations from 1994 updated in 2009, will be presented in the main gallery space. "Pneuma" is an ancient Greek word that has no equivalent in contemporary terms. It is commonly translated as soul or spirit, but it also can refer to breath or the vital life force that is said to animate the entire human and natural world. In the installation, monochrome images alternatively emerge and submerge from indistinct shadows and shifting forms hovering at the edge of recognition. The projections function more like memories or internal sensations rather than actual images of places and events. 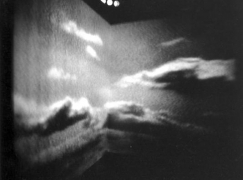 Viewers enter the space and are surrounded by images projected onto the walls of a darkened room while a constantly shifting sound field permeates the space. The title of the series Transfigurations refers to the moment when a person or an object is transformed not by external means but from within. Viola says "the transformation of the Self, usually provoked by a profound inner revelation or an overwhelming sensation of clarity and fathomless emotion, overcomes the individual until literally a 'new light' dawns on him or her… Some of the most profound human experiences occur at times like these, arising at the outer limits of conscious awareness." In Viola's Transfigurations works, black-and-white images of ghostly figures emerge slowly from complete darkness eventually passing through a threshold of water into a world of color and light. Reacting with a range of emotions from surprise, to confusion, fear and anger, often with a desire to linger, the figures are finally drawn back through to the other realm. 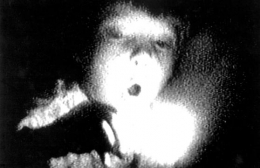 Viola combines images recorded in grainy analog video using an old surveillance camera with those shot in High-Definition video to bring the viewer to the intersection of obscurity and clarity—from death to life—and back again. The works being shown from this series are Acceptance (2008,) Incarnation (2008,) The Innocents (2008) and Small Saints (2008). Other works included in this exhibition are: Poem B (The Guest House), a triptych from 2006, in which images form a tapestry of shifting memories from the exhibitions to the present; Bodies of Light, 2006 a flat panel diptych which takes its inspiration from Tantric Buddhist descriptions of the dissolution of the body during the process of birth and death; Old Oak (Study), (2005); and Four Hands (2001). Since the early 1970's, Viola's art works have been exhibited worldwide and are included in the collections of international museums and important private collections. 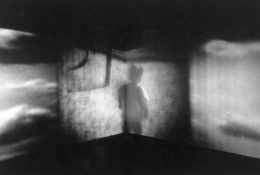 Exhibitions include: Bill Viola: Installations and Videotapes, MoMA, NY, 1987; and the travelling exhibition Bill Viola: Unseen Images, 1992-1994, organized by the Kunsthalle Düsseldorf and Kira Perov. 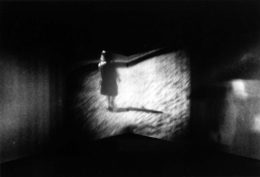 Viola represented the U.S. at the 46th Venice Biennale in 1995 with the exhibition Buried Secrets. 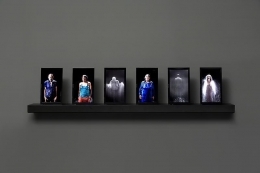 In 1997 the Whitney Museum organized Bill Viola: A 25-Year Survey that traveled to six museums in the US and Europe. In 2002, Going Forth By Day, a five part video "fresco" cycle was presented at the Deutsche Guggenheim Berlin and the Guggenheim, NY. In 2003, The Passions, originated at the J. Paul Getty Museum, CA and traveled to the National Gallery, London; the Fondacion "La Caixa" in Madrid; and the National Gallery of Australia, Canberra. Other important solo exhibitions have been mounted at the Mori Art Museum in Tokyo in 2006 and at the Zacheta National Gallery of Art, Warsaw in 2007. 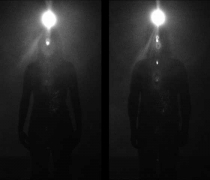 In 2008, Bill Viola: Visioni interiori, a survey exhibition organized by Kira Perov, was presented in Rome at the Palazzo delle Esposizioni. His exhibition Intimate Works is exhibitionsly on view at the De Pont, Tilburg, Netherlands through January 10, 2010. Viola is the recipient of numerous awards and honors, including a John D. and Catherine T. MacArthur Foundation Fellowship in 1989, the first Medienkunstpreis in 1993, the Commander of the Order of Arts and Letters by the French Government in 2006, the Eugene McDermott Award in the Arts, MIT in 2009 and the 2009 Catalonia International Prize. In addition to several honorary doctorates, Viola was invited to be a Scholar at the Getty Research Institute, Los Angeles in 1998. Bill Viola and Kira Perov, his wife and long-time collaborator, live and work in Long Beach, California . 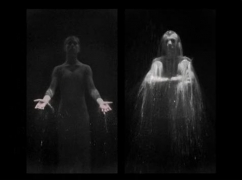 Bill Viola will give the Walter Annenberg Annual Lecture at the Whitney Museum, Oct 27 7:00pm. For further information please visit James Cohan Gallery or contact Jane Cohan at jane@jamescohan.com and 212-714-9500.